The center console skiff gently skipped through the ripples of Puget Sound. The cool air left a sting on face and hands, and the okoume on the inside of the hull gleamed in the pallid sun, but the driver’s eyes were glued to the GPS, which showed 23 knots with a nearly wide-open throttle and a fair current. That’s not exactly retina-searing stuff for an 18-foot, 5-inch powerboat, but considering the minuscule 20-hp 4-stroke hung on the stern, it was remarkable. Controlling the throttle itch and keeping it at 5,000 rpm, this rig can scoot along at 15 knots while consuming 1.4 gallons of gas an hour. That’s 1.4 gph. Sipping, not guzzling, when compared with many similarly sized production boats that schlep a ton of weight and need bigger, thirstier engines. Now the interesting part: If you want one, you must build one. That’s because the 350-pound Port Townsend Skiff is offered only as a kit — boxed, crated and delivered to your doorstep. Assembly is required, but cheap furniture it is not. Quite the contrary. 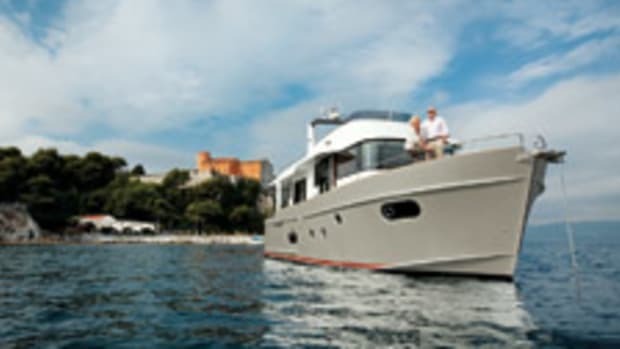 This boat blends high technology with low emissions, unusual efficiency with common sense, and traditional values with contemporary building materials. 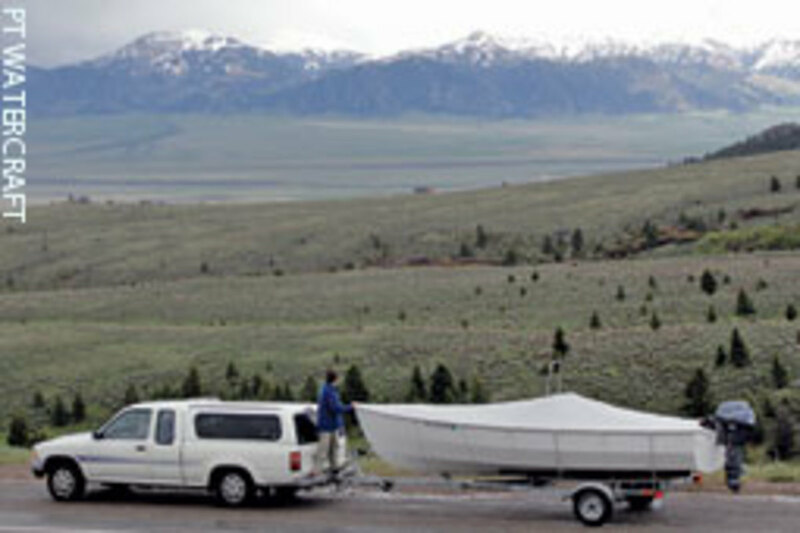 “Sometimes you have to look back to move forward,” says Russell Brown, owner of Port Townsend (Wash.) Watercraft, the company that produces and markets this kit boat (www.ptwatercraft.com). This suggests progress by unlearning poor habits that lead to complex fuel hogs and “unforgetting” what has been known about smart boat design since the late 19th century. If you want it expressed differently: The ideas that make sailboats fast help make powerboats efficient. 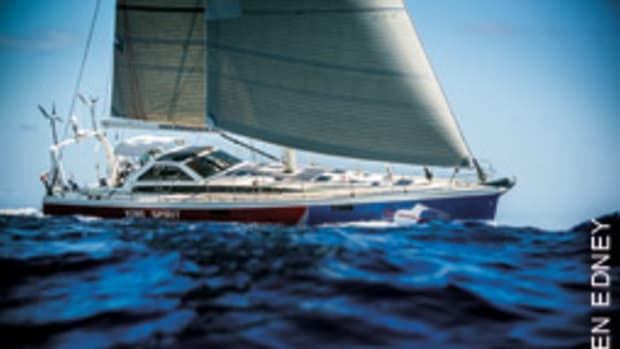 To understand the concept of this boat, it helps to look at the key contributors, all of whom live in the Pacific Northwest and have or had ties to Oracle Racing, Larry Ellison’s America’s Cup syndicate. Brown was in charge of specialty composite parts, which made him an expert in carbon honeycomb sandwich construction, the preferred building method for high-end racing sailboats. Although it yields fantastically light and strong structures, it also is expensive, wasteful and difficult to repair. 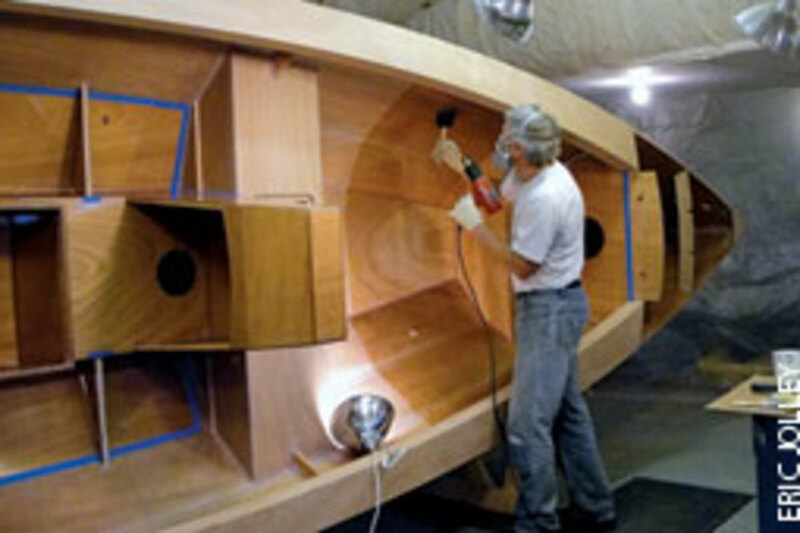 Bieker Boats in Seattle came up with the PT Skiff design for a 2009 contest run by WoodenBoat and Professional BoatBuilder magazines. Entries had to meet several criteria: 18 feet, 6 inches maximum length overall, powered by an outboard of 25 hp or less, fuel consumption of 2 gph at 15 knots carrying 650 pounds of load, and a maximum trailer weight (with engine) of 2,700 pounds. They also had to perform safely with 15 knots of breeze and a 2- to 3-foot chop on the nose. Through their design and engineering work for Oracle Racing’s Cup boats, principal Paul Bieker and business partner Eric Jolley are no strangers to efficient vessels. Bieker also has an impressive track record of building winners in the International 14 class of racing dinghies. The I-14, Bieker explains, is “light and has lots of horsepower. It has to be efficient from 4 to 20 knots carrying crew that weighs much more than the boat,” he says. “The PT Skiff is a performance boat, light and slender, so it is on the tippy side, but it has a great advantage,” says Bieker. “It is efficient across the entire speed range, just like the I-14. 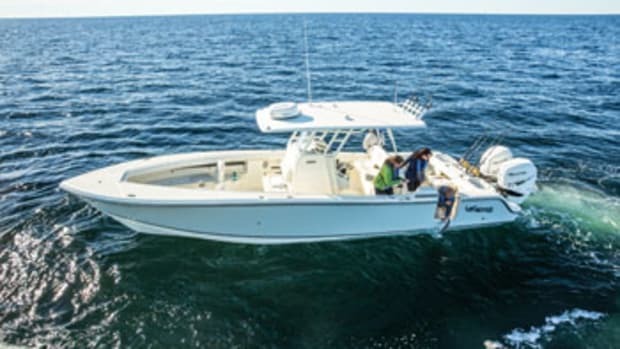 It’s the kind of boat people should be running.” To dampen pounding in choppy waters and to add stability at the dock, the boat can take as much as 37 gallons of water ballast. Now Brown builds the kits that make Bieker’s design accessible to the do-it-yourselfer who wants to build a stitch-and-glue craft that is light, efficient and highly customizable. “Kits express everything we did long before getting involved in the America’s Cup,” Bieker says. The firm’s lofting expertise, he says, goes back 20 years to a time when it worked on designs for steel and aluminum ships. Cutting a good kit is no piece of cake. Brown works with Turn Point Design in Port Townsend, which operates a five-axis CNC router to cut the plywood pieces with surgical precision. He insists on high-quality Joubert okoume because it is lighter than mahogany. The router works from CAD drawings that are optimized for cutting, spacing, sequence and router bit changes. 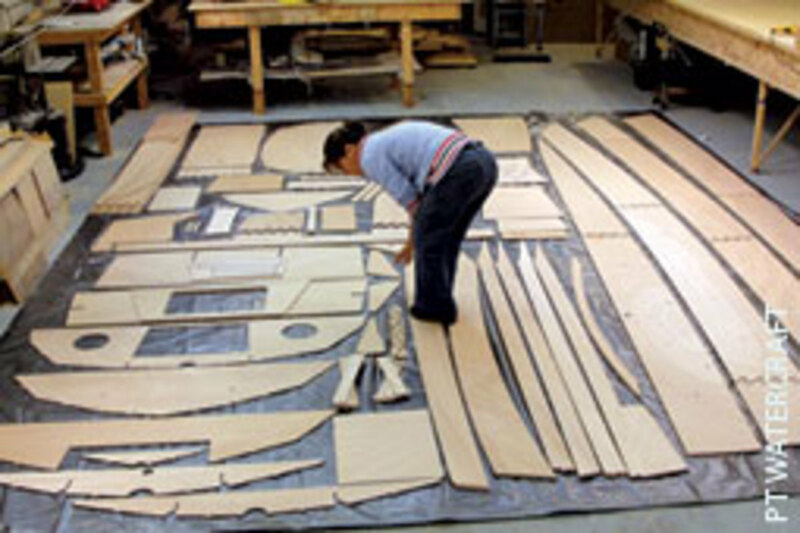 To guarantee absolute accuracy of the puzzle-piece joints, the plywood sheets are held in place with a vacuum system. Turn Point’s owner, Brandon Davis, has been cutting parts, molds and tooling for Ellison’s America’s Cup boats and was involved with the new AC45 catamaran that was launched last January. 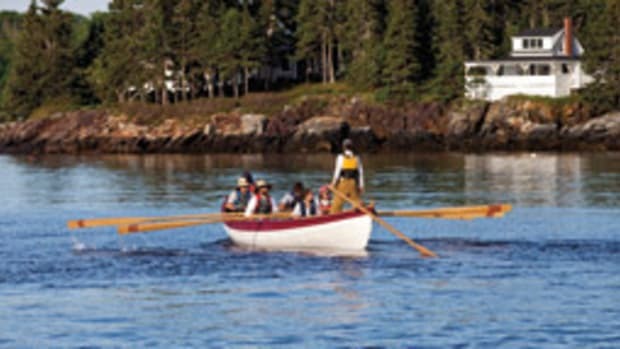 Students built the first PT Skiff in a class that Brown taught at the Northwest School of Wooden Boatbuilding. Brown then built hull No. 2 and took it across the country to show it on the East Coast. The Coast Guard tested the boat at its facility in Solomons, Md., and approved it for a safe capacity rating and for flotation and stability when flooded. 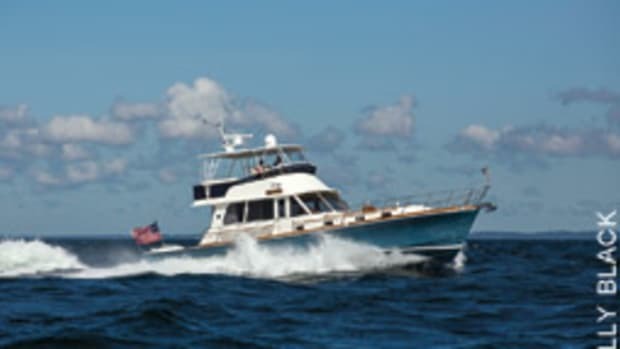 From there, Brown and his wife, Ashlyn, trekked north to New England to show the boat at the WoodenBoat Show in Mystic, Conn., and for some weekending on Buzzards Bay, Mass., and around Block Island, R.I. “We’ve been through some nasty stuff, so we know the boat can handle it,” Brown says. Byrnes’ work, but noted that their boat reached the same top speed with 20 hp as Marissa did with 30 horses. “While it has been highly praised, the PT Skiff has not been given any awards,” Ashlyn Brown says. A great deal of what makes the Port Townsend Skiff special comes from the kind of thinking that guides design decisions for the America’s Cup, where winning a race first requires winning the efficiency game. But it also reflects Brown’s rich and varied experience as a builder and sailor. He is the younger of two sons of James Brown, one of the early trimaran pioneers and designers (search the SoundingsOnline.com archives for “James Brown”). He built Scrimshaw, a 31-foot cruising trimaran, in the late 1960s when the Brown family lived near Santa Cruz, Calif. An extended family cruise in the early 1970s to Central America and the U.S. East Coast helped form the lives of Russell Brown and his older brother, Steve, who became master boatbuilders. As a teenager, Russell Brown turned his attention to the proa, a sailing craft of Polynesian origin that has two hulls of unequal lengths and shunts to change direction as bow becomes stern, and vice versa. 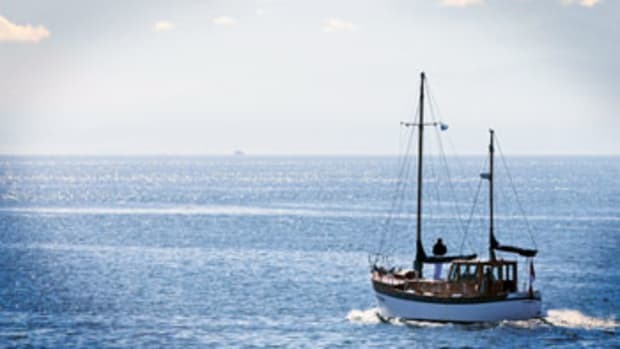 These little-explored boats offered a wide-open playing field for his creative ideas. That’s why Brown designed, built and cruised several of them, including the 36-foot Jzerro, which he sailed from San Francisco to New Zealand. John Harris, the owner of Chesapeake Light Craft, a company in Annapolis, Md., that builds and sells kit boats and designs proas on the side, says Brown inspires him. He calls Brown the “foremost expert for Pacific proas.” (Read more about Brown’s proa philosophy and adventures under on Harris’ “The Life of Boats” blog at www.clcboats.com.) 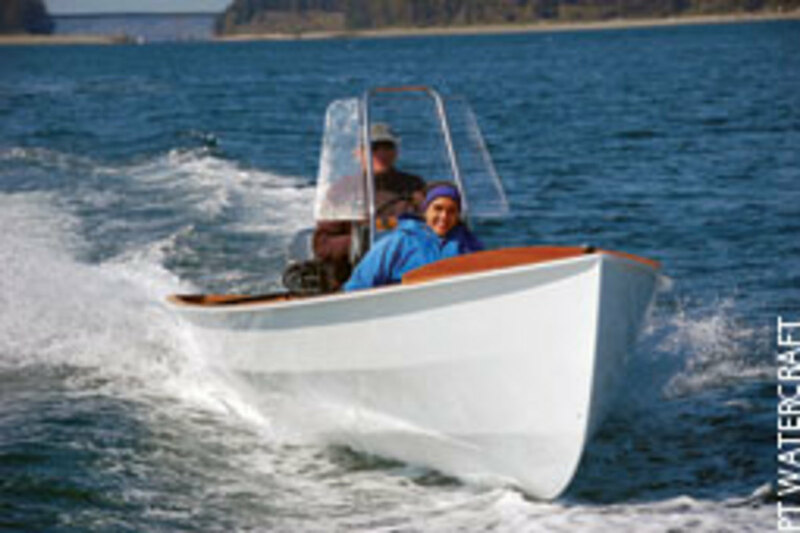 Harris also is a customer of Port Townsend Watercraft, buying high-end composite parts for his kit boats. Back out on the water for that sea trial, the PT Skiff was scooting right along, tracking as if on rails, thanks to a nifty little keel fin under the boat. Hustling toward Fort Worden and coaxing her into a tight turn around the weather buoy was child’s play, and even more fun by leaning into it. 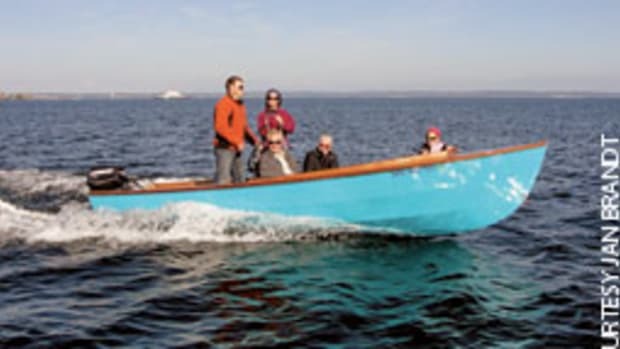 For all its qualities, the Port Townsend Skiff is not a boat for everyone, but if Brown has his way it might be the answer for boaters who want to simplify, downsize and reduce carbon emissions. 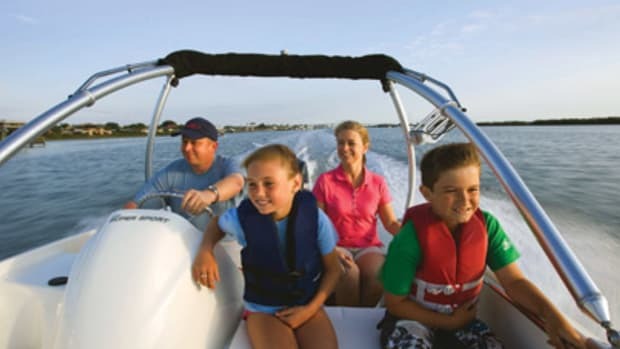 As a launch, runabout, fishing skiff or chase boat, it can cut a nice figure in many applications. Customers have to be ready to take on a garage project, but that’s one of the reasons it’s special. The reward is not just a spiffy and efficient little boat, but also a product that users create with their own hands, making it unique and starkly different from the common and aesthetically challenged white plastic tubs. And that would sit well with Capt. Nat who, like Brown, built some pretty high-tech boats in his day.